Should you stay at home and live like a hermit? Buy a helicopter? Unfortunately, we all can't stay at home or have a personal helicopter on hand so if you must get in a car to get around, what is the best way of reducing your chances of getting involved in a car accident? Well, according to insurance company AAMI, one of the best ways of reducing the risk of a prang is avoiding the following Adelaide roads. AAMI have revealed Adelaide worst five stretches of road according to the number of claims they have received. In total, the following five roads accounted for 124 accidents in the 12 months up to July 2012. 1. South Road in Edwardstown totalled 28 accidents. 2. West Terrace in Adelaide had 26 crashes. 3. Marion Road in Marion racked up 25 smashes. 4. Main North Road, Elizabeth managed 23 bingles. 5. Brighton Road, Brighton accounted for 22 prangs. AAMI spokesperson Reuben Aitchison said "A moment's lapse in concentration or judgement or letting your impatience get the better of you can easily lead to a crash. 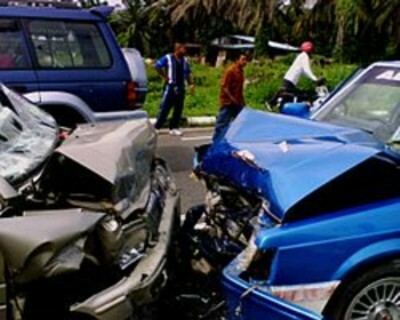 Best case scenario you have a fender bender, but unfortunately we also see far worse." The report stated that nearly 45% of drivers blame other drivers for their accident, while 29% say plain carelessness was a contributing factor in their crash and 28% blame distraction or loss of concentration. So if you can't avoid driving along these roads WeekendNotes readers, drive carefully and keep your eyes peeled. You have been warned.